This wont be a Raptor either though. That's a bit of an important note. When all is said and done it may not be even much better than an F-35. It woudnt be the first military program that goes from "wonder weapon" to "wonder why"
XanderCrews wrote: When all is said and done it may not be even much better than an F-35. It woudnt be the first military program that goes from "wonder weapon" to "wonder why"
The deal with Japan is distance to China and the disputed islands, it wants a long range air superiority platform to confront J-20s far from its shores. The F-22 with 2 tanks surpasses the stock F-35 in combat radius and no doubt they will plumb the other two pylons so it can carry 4 tanks and have a combat radius over 1000nm. This is not taking into account its greater radar range and kinematic performance making it a more effective interceptor. The reasoning behind this aircraft is the same as that behind the PCA, performance at long fighter range for the Pacific environment which is why it probably will happen, Japan probably views it as essential to safeguard its extended sovereignty. If it happened (I have my doubts), I'm fairly confident they would not be at all interested in bags and pylons under VLO wings designed for high-altitude fast long-range cruise. Think conformal tanks or else a fuselage stretch, for lower drag and VLO. And if you're going to do that, then you may as well make the bays bigger and give it F-35A-like sensors, comms and max-adaptive tactical and role flexibility. Then you're looking at something very similar to PCA--and that will not escape anyone's notice or logic in their further considerations. Your point about Pacific geography and its scale is entirely correct. F-35A and F-22A still fall well short on the typical tactical strike ranges involved for an Indo-Pac archipelagic conflict. Significant war stocks of theatre-range precision BM strike upon fixed targets means extra tactical range is desirable, and will be becoming more important from here. The reply to much longer cruise distance needs is to have a much faster and superior-efficiency high-altitude cruise (something which is not as unavoidable in a European theatre conflict and smaller more compact countries/territories--and the "need for speed" is almost entirely for cruising--i.e. not merely for a BVR kinematic advantage). So a large PCA with its modern variable mode efficient cruise propulsion will be ideal for the Indo-Pac regional range problem (and the J20 design is clearly aspiring to be that). I think that's what everyone who shares this problem will conclude, and will seek to invest accordingly, for the middle-2030s forwards, with that sort of range capability and F-35-like extreme tactical adaptability in mind. So I think PCA is a no brainer for USAF from here, and for US's Pacific Allies--a 'need to have' platform. I suspect that's what Japan is expected to conclude from an evaluation of its options. Last edited by element1loop on 28 Aug 2018, 01:09, edited 1 time in total. As I understand it an AETP design won't fit in the F-35--but if it did, conformal tanks may provide the needed legs. The problem then is achieving a stable envelope region with genuinely high-altitude fast long-range cruise. 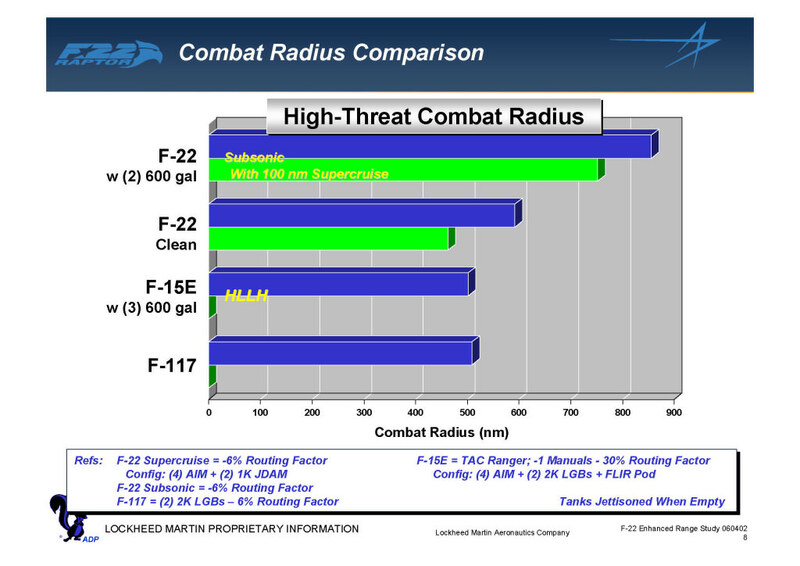 In that respect the F-35C's large wing would certainly be more stable in thinner air (plus adds more fuel). So the question then is, do you have enough internal weapons with an F-35? The answer for the F-35 is to buy more of them and operate more in aggressive deep-striking. Then the question is, will F-35 meet PCA-like requirements for survivable loiter at long range over a defended heartland in say, 2055? There's a few ifs there, but maybe it can do most of it--enough to work with it, tactically, anyway. A key design requirement of the adaptive engine designs from GE and P&W is compatibility with the.F-35 engine bay. We can see the move toward new.generations of weapons designed for the F-35 internal.weapons bay eg. JSM, SACM, AARGM-ER, and this trend will.only accelerate so I think war planners will have lots of choices.down the road. With 5G a/c, SA has clearly superseded kinematics as the decisive must-have advantage. A networked battlespace extending over much greater distances affords the precious luxury of longer response times to threats so absolute interception speed becomes even less critical. Couple this with longer-range multimode AAMs that will provide all the kinematic performance to deal with threats. I tend to agree with that, as long as the relative SA and systems advantage can be maintained. The other big advantage here is you still have an extremely small VLO jet, which can then operate 20km above sea level, and as you go upward the tops of all the imaginary projected sensor footprint "bubbles" rapidly shrink in radius, at your altitude, and it becomes much more difficult to detect, track or engage with a useful pk. Providing a less obstructed path to targets, or to nav. And a good insurance policy against newer detection and tracking tech evolution. It also sets the propulsion bar much higher for those airforces forced to use heavy-twins with dodgy self-FODing engines, who'd like to do something about it. However, the need for speed needs some re-emphasis here (it seems to be getting lost in your last reply). With very long distances comes very long flight hours. A single-pilot regional-range deep-strike pilot needs that flight time to be made several hours shorter. So this has to be a serious consideration in high-altitude high-speed cruise efficiency, and long flight pilot comfort. Else strike tempo will not be maintained. Sustained high-speed will need to be a major feature of a suitable jet so must be a major focus of the development of any such variant. WILD SPECULATION.....The F-35 is more than capable of performing the "Air Superiority Role" for Japan against all comers! As a matter of fact the F-35's advantages in Stealth and Sensor Fusion. Give the Lightning many advantages over even the Raptor including some in the "Air to Air Role". So, spare us that it's "not enough"??? To make it clear Japan is not building the F-3. Nor, is it buying any version of the F-22. What it is doing is planning for post 2030-40. Which, likely will include joining with a partner or partners to jointly develop a future 6th Generation Fighter. popcorn wrote: A key design requirement of the adaptive engine designs from GE and P&W is compatibility with the.F-35 engine bay. Corsair1963 wrote: To make it clear Japan is not building the F-3. Nor, is it buying any version of the F-22. What it is doing is planning for post 2030-40. Which, likely will include joining with a partner or partners to jointly develop a future 6th Generation Fighter. Maybe this Hybrid F-22/35 will be Japan's next gen fighter. They can call it 6th gen, we can call it 5.5 gen, heck I'll call it an X-wing.